An overgrown wetland located on public open space below Table Mountain, South Africa, presented the Landscape architect Steyn Swanepoel, from SSLAD and Luis Jordaan of Force Ten, the Terraforce contactor, with complex site conditions in devising a remedial solution. 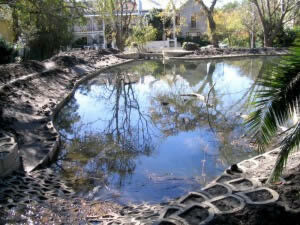 The wetland is fed by a natural spring and runs continuously throughout the year with the water being left to drain into the surrounding soil. In winter, when there is a surplus of water, the excess was channeled into the city’s storm water system and disposed into the sea. 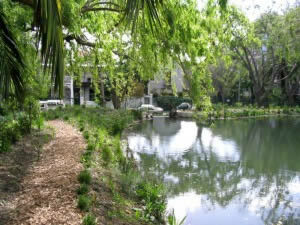 Over the years the area degraded into an environmental problem, with alien vegetation taking hold, leading to a decision to transform the site into mixed indigenous environment featuring a bird and fish sanctuary with a 500-m² pond. Because of the particular soil conditions it was decided to line/demarcate the dam perimeter with a dam ‘wall’ constructed using Terraforce blocks to ensure long-term sustainability. 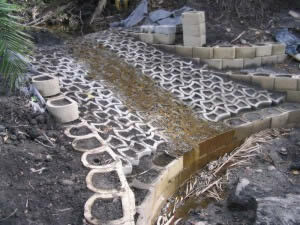 This would prevent the excavated hole from shrinking (unstable mud from the sides breaking up over time) and alien plants establishing on the banks. 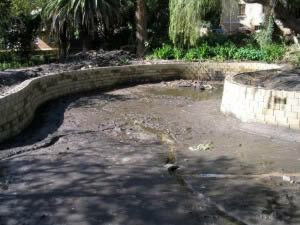 Due to the high water table in this area, permeability was an essential requirement ruling out a waterproof structure. 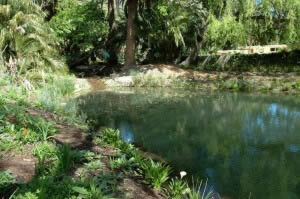 Another important consideration was maintenance of the site, which was catered for in the design criteria by constructing the pond to a depth of at least 1,2 metres to avoid the spread of alien water plants. A visibly demarcated shoreline facilitates the ease of this task. A year later, the wetland is hardly recognizable anymore. What made this project particularly challenging was the fact that all planning carried out in the winter months, with actual execution taking place in summer (the driest months) when site conditions would determine the optimum construction method. There was no way of predicting whether the excavations and Terraforce walling would be feasible in water saturated soil conditions, especially with a continuous spring feeding the area. 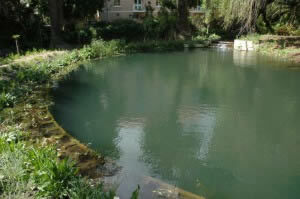 Swanepoel (SSLAD) envisioned a pool with crystal clear water, conducive to indigenous fauna and flora. 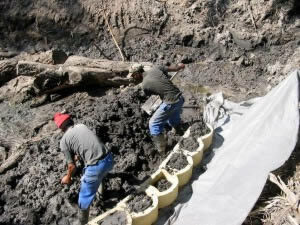 In the middle of January 2005, channels where dug to divert the water from the core area, but before work could start in earnest, other issues had to be dealt with. 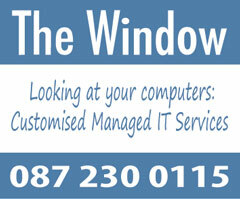 The site is situated in the middle of a suburb with limited working space and all construction methods had to be approved for suitability to sensitive wetland. Excavation revealed a layer of firm, coarse sand at the correct level for the foundations and coarse gravel in bags were placed in a shallow trench and wrapped in non-woven geofabric, which extends behind the Terraforce L11 blocks, all the way to the top. 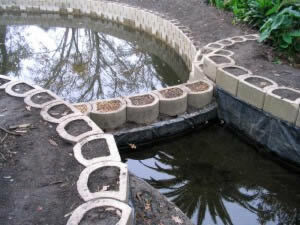 To prevent problem plants from encroaching with ease, the walls are constructed at a steep angle of 85°, while the in and outlet areas will allow migration of various creatures even when water flow has to be diverted for maintenance purposes. Debris build up is minimised behind the outlet by the smooth, gently curved precast concrete overflow. 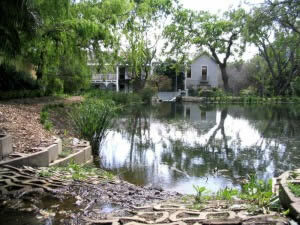 Swanepoel envisioned a pool with crystal clear water encouraging indigenous fauna and flora. 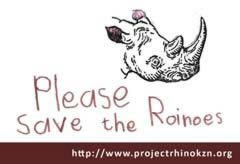 To this end Ernst van Jaarsveld of Kirstenbosch National Botanical Gardens was consulted. He suggested water plants that absorb minerals and nitrates and in addition release oxygen into the water, as well as artificial underwater shelters in the form of old tyres to anchor the plants. With the seedlings and plants in place the drainage pump inside the pond was switched off and the water level rose slowly to allow the stream to runs it’s old course. Now, a year later, the wetland is hardly recognizable anymore. 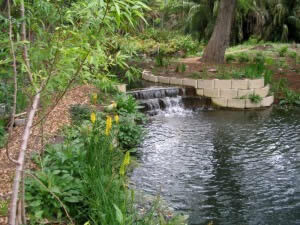 Alien plants are replaced with lush indigenous grasses and shrubs in full bloom, and a walkway around the pond allows for the residents, with permission form the Cape Town bird club, to enjoy the area.